A landmark oceanfront restaurant in La Jolla with sophisticated, seasonal cuisine and seafood from chef Bernard Guillas. 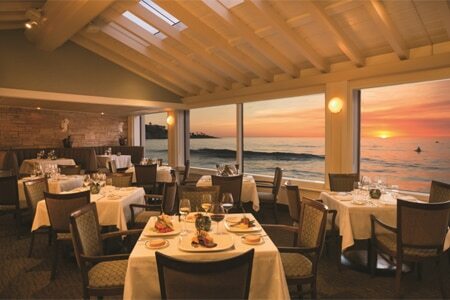 : La Jolla’s Marine Room owes its reputation as much to chef Bernard Guillas as to the wall-to-wall beachfront view. Guillas continues to be a force in San Diego cuisine, championing farm-fresh, locally grown foods and remaining current after many years of success. Adventurous, flavor-seeking diners will be pleased with dishes that intelligently and intuitively match ingredients. To further commune with the ocean, start with the signature lobster bisque. For entrées, a sweet, slightly briny diver scallop rests on honey spiced farro, with fennel confit and saffron infusion. Center cut Black Angus filet mignon comes with Angelino plum chutney and truffle potatoes. Togarashi sesame-crusted ahi charges the palate with its white port hibiscus reduction. The sophisticated wine program holds up its end equally well. Don't miss a chance to dine with crashing waves against the glass windows as a backdrop at the High Tide breakfasts, held on specific dates throughout the year. Expect the likes of black tea/rum-smoked salmon, Grand Marnier chocolate brioche french toast, and wild mushroom frittatas. The Marine Room is a place to share holiday meals and special occasions.